We received complimentary products to facilitate our review. All thoughts are my own. What a couple weeks it has been with our entire family sick…. Keeping the kids entertained while trying to simultaneously get some rest ourselves has been quite the challenge to say the least. Luckily, the boys got lots of use from one of their favorite new toys: Sack Pals. I wanted to share with you all because I know your kids will love them, too! SackPals are SO cute and SO fun! They are little child size sacks made from super super SUPER soft and cozy fabric. They have a little area on the top that allows cute little Velcro animal friends to stick to the sack along with some other fun items so your kids can play and stay cozy. Our boys were SO excited when these arrived in the mail last month and have been using them almost every day since! They are the perfect size for both Andrew (age 5) and Aidan (age 3) with a little room to grow yet. The fabric is seriously so soft and cozy I want one in my size! 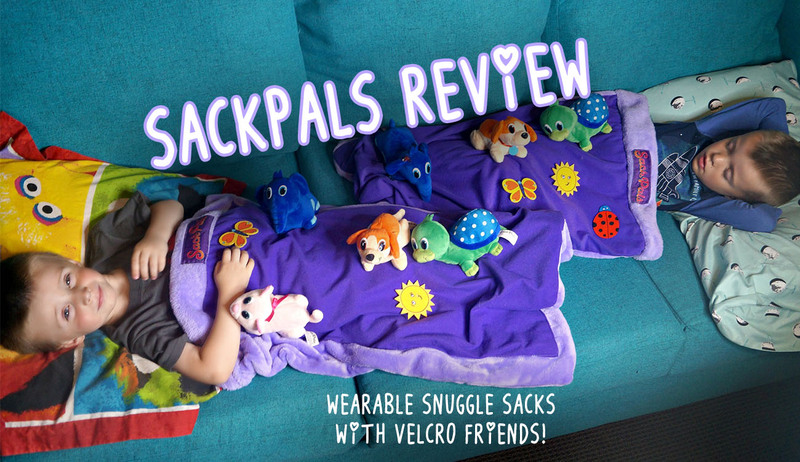 Each SackPals kit includes a reversible Snuggle sack, 4 little pet friends that Velcro onto the dark purple area of the sack: Theodore the turtle, Emilee the kitty, Henry the puppy, and Elliot the elephant along with 4 pieces of sack bling (a sun, ladybug, star, and butterfly). I would definitely say these fun play sets are gender neutral. My boys both LOVE them! They are easy to use and store. Inside the sack is a pocket where your kids can store all of their friends and sack bling until the next use. It Velcros shut to keep them safe inside. I’m so excited that my kids love these so much! Every time we watch a movie, they run and grab their sacks. They’ve also enjoyed using them on the couch together while they’ve been sick as they watch their favorite shows. Having the little animals to play with and stick to the sack makes it very easy for them to feel like they are surrounded by friends. Aidan also loves to lay in his Snuggle sack during nap time! I think these are a huge hit and definitely recommend them to other moms! In the future when we plan our next road trip, the SackPals will definitely be on our list of things to pack! You can learn more about SackPals here on their website and SackPals are also available for purchase on Amazon here for only $39! Be sure to sign up for their mailing list so you can be notified with the next set of friends is released. Look how cute they are! Follow SackPals on Facebook for more info! How would YOUR kids use SackPals?